I have always seen these paintings around different places and admired them, but never knew who the artist was. I've never taken any kind of art history class and didn't know who to ask about these magnificent paintings. Well, thank God for the internet! I was going down the list of new blog posts in my Google Reader and someone had posted about this artist! 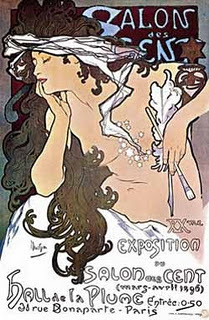 His name is Alphonse Mucha. Apparently his style was called Art Nouveau. I can't say I am very educated in the art world or art history, but I just love these paintings. They really catch my attention and I would looove to have one of these beautiful pieces hanging on my wall some day.